The distinction between ‘passengers’ and ‘industrial personnel’, as applied to wind farm turbine technicians, has long proven a matter of contention. Until recently, boatbuilders looking to produce offshore wind farm support vessels (OWFSVs) carrying more than 12 ‘passengers’ had to comply with the terms of IMO’s HSC 2000 Code for fast ferries – a time-consuming and costly process. To remain cost-competitive and optimise vessel availability, many designers and builders capped their ambitions for larger vessels capable of carrying 24, 36 or more turbine technicians, and restricted themselves to the production of 12-technician CTVs under the MCA Workboat Code. This is a rare case where the rhetorical question ‘what’s in a name?’ has proved critical to vessel development. On one hand, turbine technicians could legitimately be described as OWFSV ‘passengers’ in as much as they are not crew .However, this definition fails to acknowledge that most technicians have undergone compulsory safety training and fitness tests and are familiar with evacuation procedures.This contrasts with the typical ferry passenger, who may have no maritime experience at all. Subsequently, in 2014, Germany advanced the case for reclassifying ‘passengers’ as ‘industrial personnel’, in recognition of the distinction between the two categories and to enable the construction of larger OWFSVs with greater technician capacity, without having to jump through the hoops of HSC 2000 Code compliance. This move served as an inspiration to the UK’s National Workboat Association (NWA) and MCA – both of whom, shortly afterwards, formed a working group with various class societies to develop a draft code for the UK. These changes are progressing at IMO, though it is likely to be 2024 before they are fully incorporated into SOLAS. As an interim measure, compliance with the UK’s High Speed – Offshore Service Craft (HS-OSC) Code, as it has been dubbed, is “similar to complying with the HSC Code, but with a few specific, ‘passenger’-related relaxations,” according to Mark Ranson, NWA secretary. The draft code would be applicable to boats under 500tonnes; vessels under 24m in length would be permitted to carry up to 36 personnel, while, for larger boats, a maximum of 60 persons would be allowed. “The full HSC 2000 Code provides an operational certificate for one route; moving from A to B,” Ranson explains. “The HS-OSC Code allows for a number of different routes, freeing up the vessel to travel around various wind farms.” And, from a budgetary perspective, Ranson confirms that compliance with the HS-OSC Code will prove less costly than applying for the HSC 2000 Code. As a result, the first HS-OSC-certified UK vessel is very close to hitting the water. The 26.9m x 9.4m Seacat Enterprise, which was built at South Boats IoW for Seacat Services, can carry up to 24 ‘industrial personnel’; however, the craft has also been developed to comply with the Workboat Code, meaning “we can take 12 ‘industrial personnel’ and 12 designated ‘passengers’,” Seacat MD Ian Baylis says. Seacat Enterprise can carry up to 40tonnes of cargo in total; her 34m² forward deck allows for up to 10tonnes and features a single 20ft ISO container mount, while the 80m² aft deck permits the carriage of up to 30tonnes, and can accommodate three 20ft or four 10ft ISO containers. The fore deck is also equipped with a TMP 500L crane, and the aft deck with an Effer 275M crane. Her size aside, Seacat Enterprise also differs from past Seacat designs when it comes to her layout. The vessel’s three crew cabins, providing berth for six crew members, are now situated on the deck, rather than below and in the hulls, says Baylis. "Historically, the galley was located in the middle of the ship structure – but this has been pushed forward on Seacat Enterprise,” he adds. The interior has been designed in a modular fashion, enabling customers to swap in and out features depending on their missions. 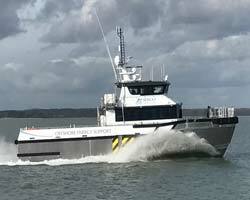 At time of going to press, Seacat Enterprise was “weeks away” from being formally delivered, though, Baylis says, there is “no fixed delivery date – we want to make sure the vessel is perfect before we put it into service”. Seacat also plans to modify its existing 26m craft Seacat Courageous, which has the capacity for 24 technicians, to comply with the HS-OSC Code.